Mural on side of building in Seward, Alaska. 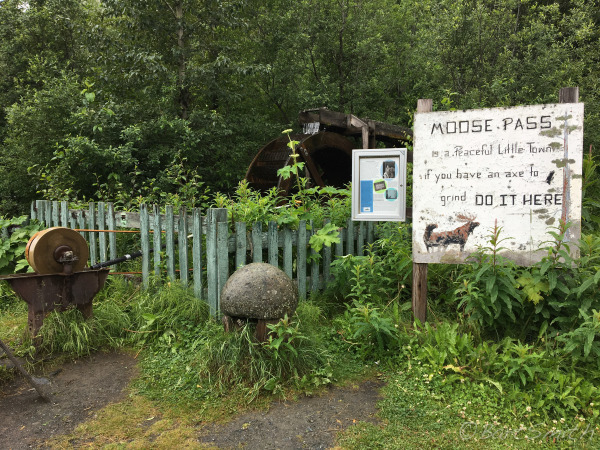 Near the southern starting point of the Iditarod Trail. 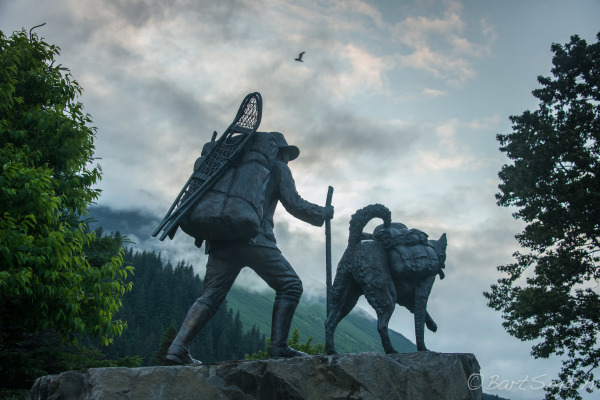 Bronze sculpture titled "Trail Blazers" at the southern terminus of the Iditarod Trail, Seward, Alaska. 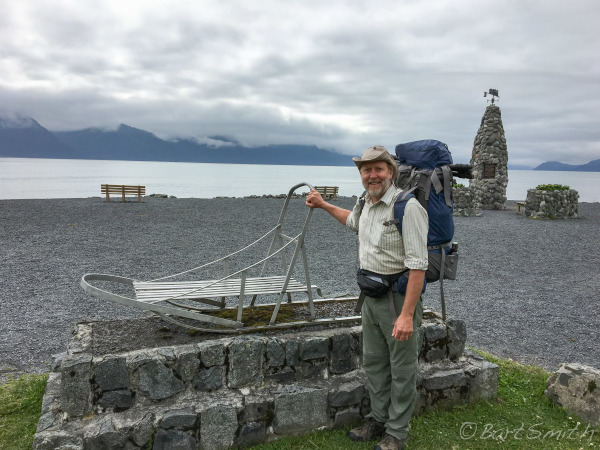 Myself at Seward Waterfront Park at the start of my walk to Anchorage along the route of the historic Iditarod Trail. Seward, Alaska. 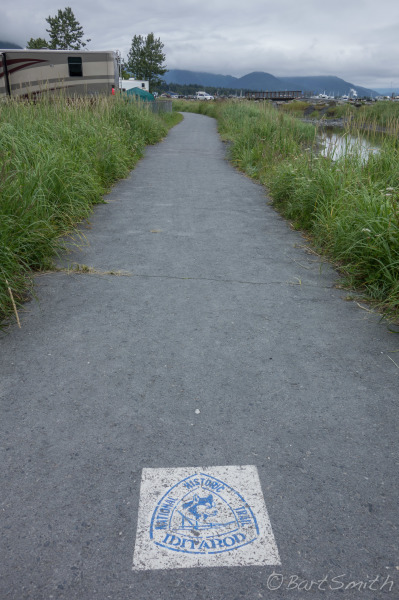 The Iditarod Trail along Seward Waterfront Park, Seward, Alaska. 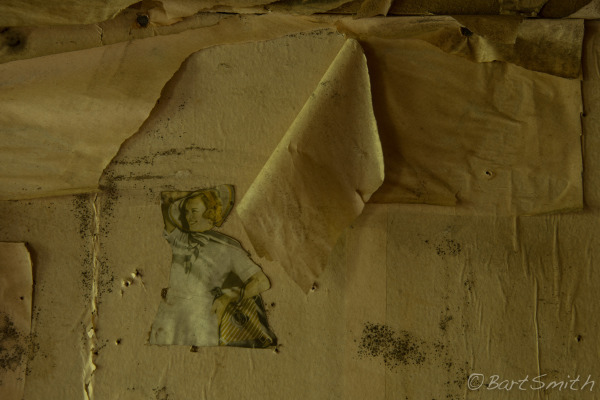 Whimsical (creepy?) 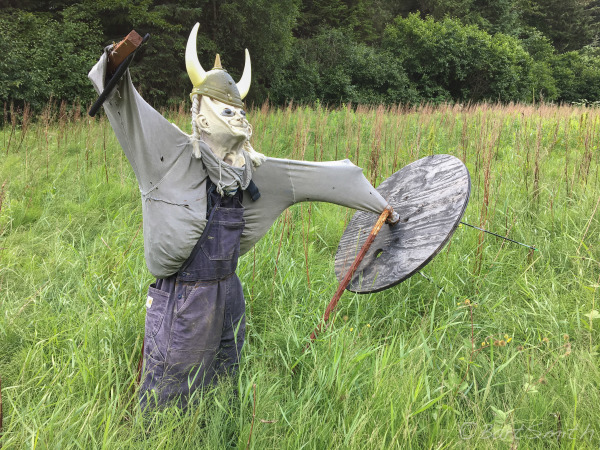 yard artwork along Seward HWY just north of Primrose, Alaska. 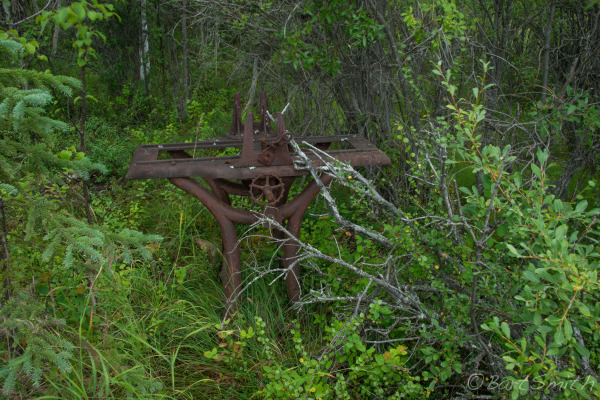 Operating waterwheel grinder at Moose Pass, Alaska. 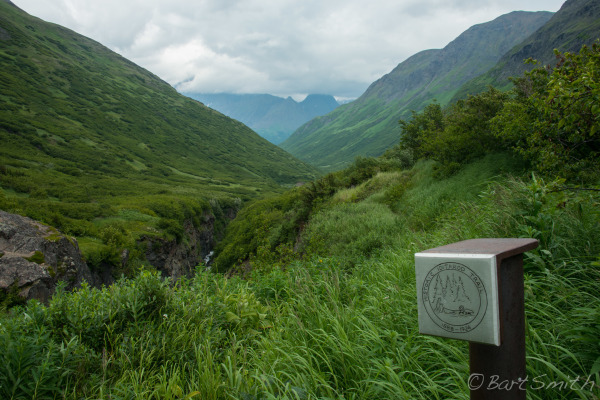 Original trace of the Iditarod Route north of Seward along what is today called Johnson Pass Trail, Chugach National Forest, Alaska. 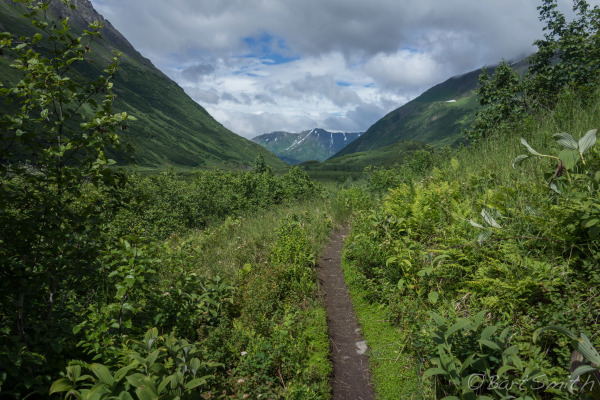 Iditarod Route along what is today called Johnson Pass Trail descending northbound from Johnson Pass, Chugach National Forest, Alaska. 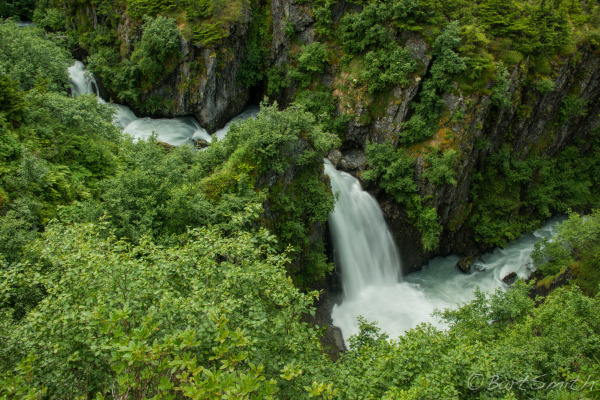 Waterfall along Bench Creek from Johnson Pass Trail, Chugach National Forest, Alaska. 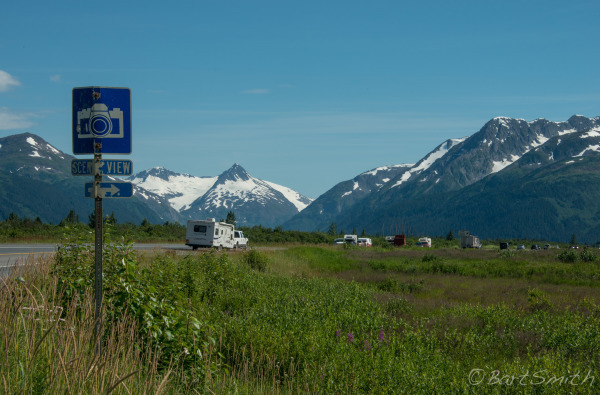 Sign along Seward HWY welcoming folks to Kenai Peninsula, Chugach National Forest, Alaska. Chugach Mountains from Seward HWY, nearing Turnagain Arm Bay, Chugach National Forest, Alaska. 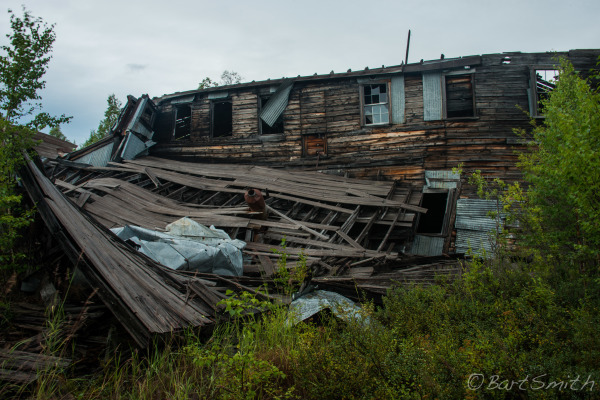 Crow Creek Historic Gold Mine. 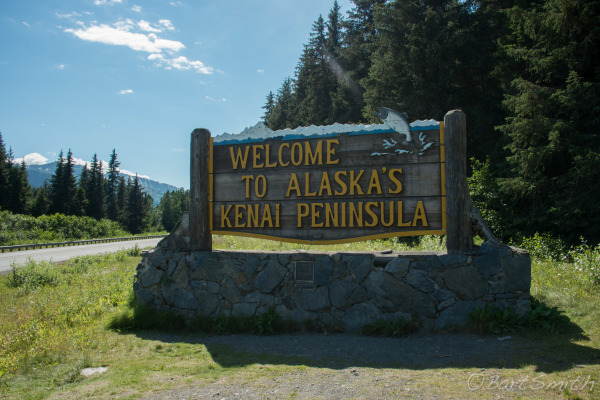 Ironic how many gold seekers traversed the Iditarod passing this location on their way to the gold rush town of Iditarod hundreds of rugged miles further north. Near Aleska, Alaska. 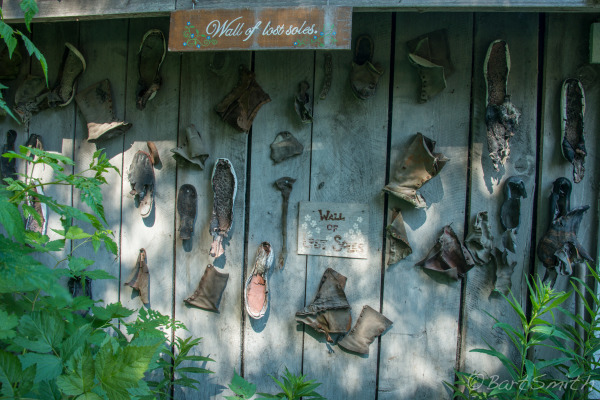 Wall of lost Soles. 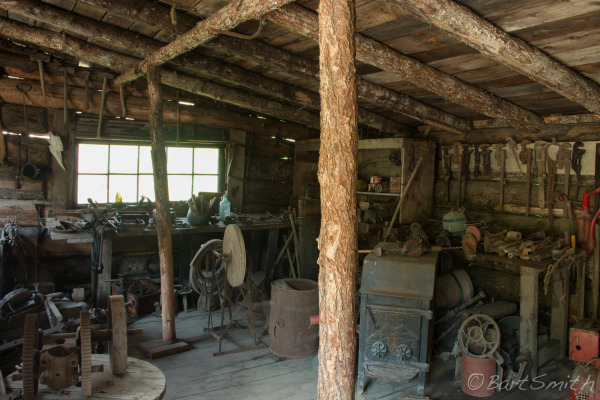 Crow Creek Historic Gold Mine. Ironic how many gold seekers traversed the Iditarod and past right over this location on their way to the gold rush town of Iditarod hundreds of rugged miles further north. Alaska. 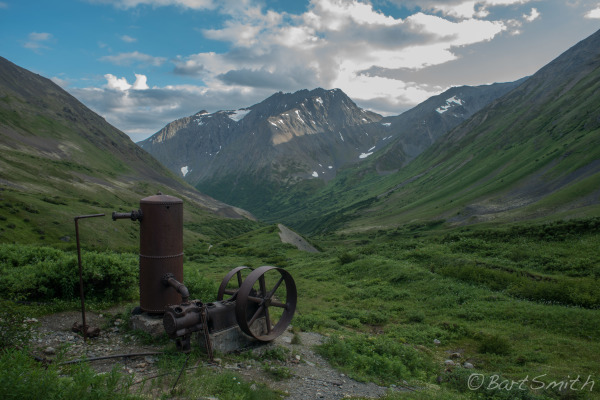 Remnants of a gold mine along Crow Pass Trail, (historic Iditarod Trail route) Chugach Mountains, Chugach National Forest, Alaska. 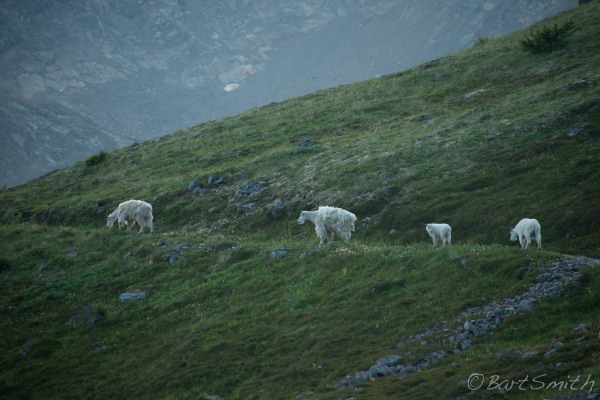 Dall Sheep walking along Crow Pass Trail, (historic Iditarod Trail route) Chugach Mountians, Chugach National Forest, Alaska. Crystal Lake Cirque from Crow Pass Trail which follows the Historic Route of the Iditarod Trail, Chugach National Forest, Alaska. 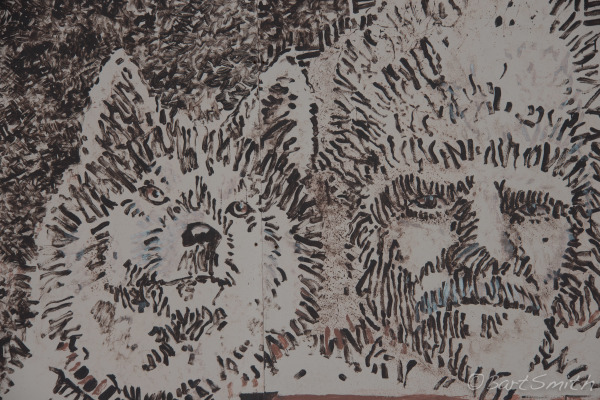 Weathered sign atop Crow Pass, the highest spot on the entire Historic Iditarod Trail. 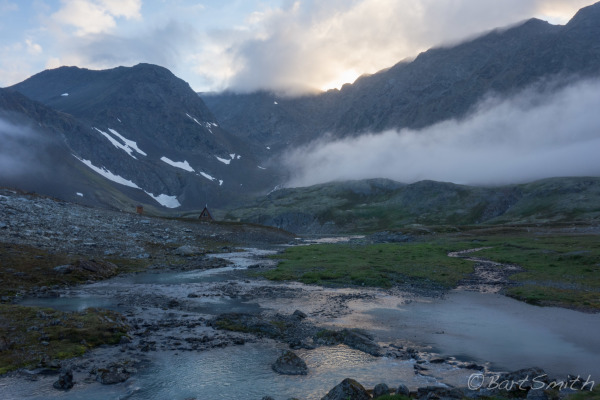 Crow Pass Trail, Chugach National Forest, Alaska. 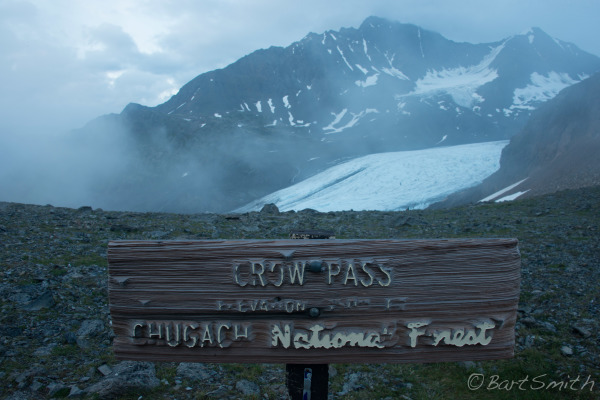 Raven Creek Valley from Crow Pass Trail which follows the Historic Route of the Iditarod Trail, Chugach National Forest, Alaska. 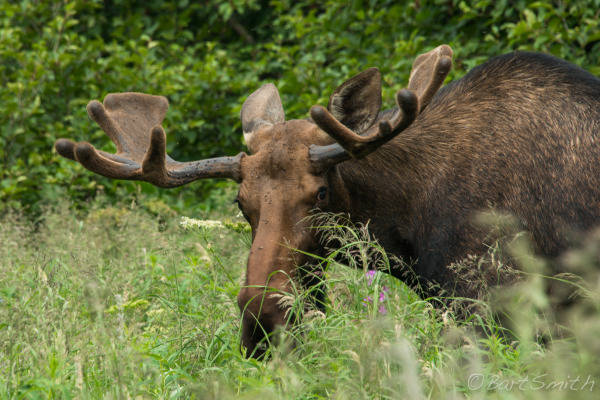 Bull Moose in Raven Creek Valley from the Crow Pass Trail which follows the Iditarod Route, Chugach State Park, Alaska. 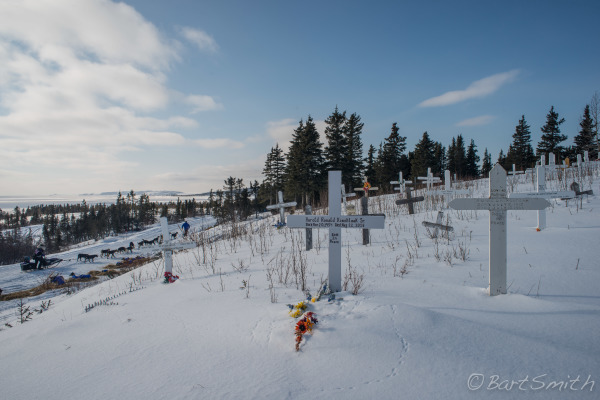 Grave sites at historic St Nicholas Orthodox Church. 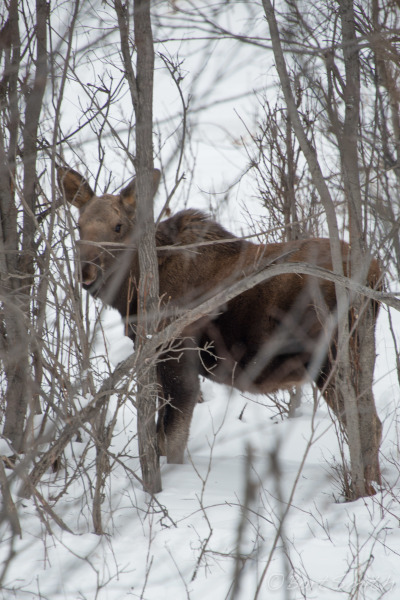 Next to Eklutna Historical Park, Near HW 1 northwest of the town of Eagle River, Alaska. 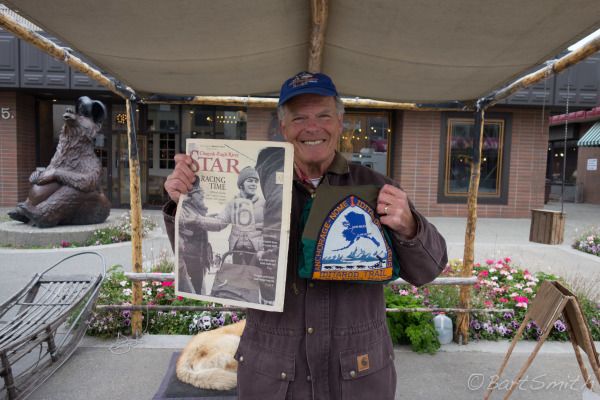 Rod Perry, Raced in the first Iditarod. Here he is talking up the trail and selling his new memoir, downtown Anchorage. Alaska. 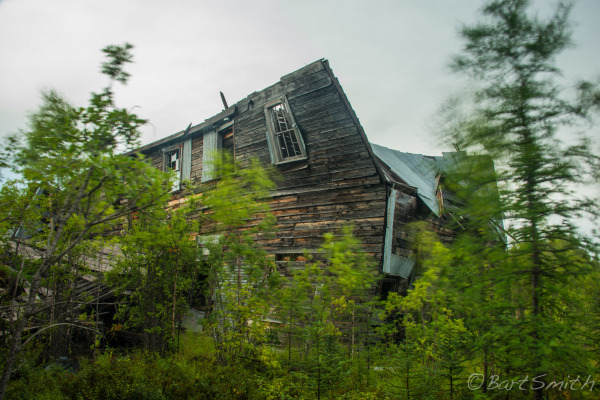 Peter, a gold prospector who helped me out immensely during my unplanned stay in the ghost town of Flat, Alaska. 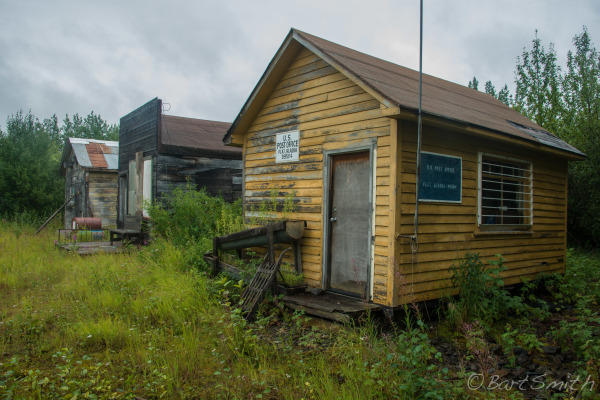 Exterior of the Northern Commercial Company Store in the ghost town of Iditarod. The building is partially collapsed and one of just a few buildings still standing. Iditarod, Alaska. 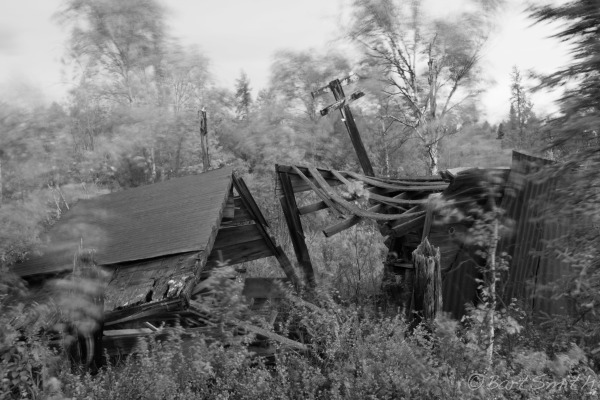 Exterior of the Northern Commercial Company Store in the ghost town of Iditarod. As soon as word got out in 1909 that gold was discovered at a location along the Iditarod River the last Alaskan gold rush ensued. 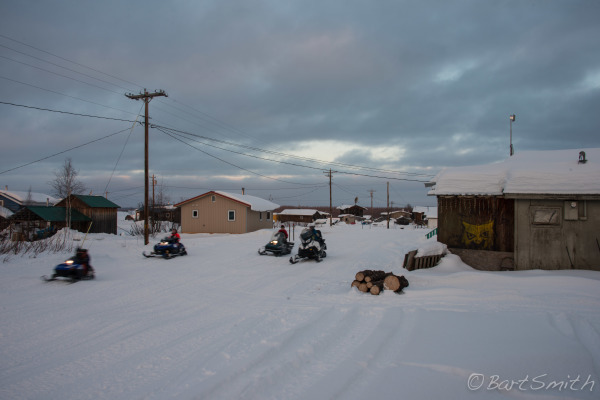 Quickly a town sprung up near the gold site on a bend of the Iditarod taking the rivers name. 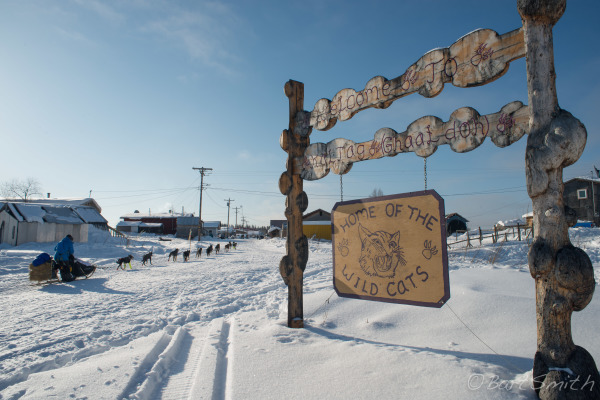 The town of Iditarod reached a population of near 10,000 gold seekers by 1919. Almost as quickly the population decreased. A classic boom and bust gold town. 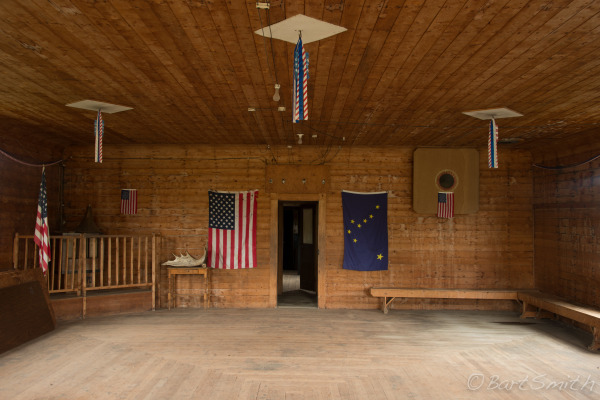 Interior of the Northern Commercial Company Store in the ghost town of Iditarod. Alaska. 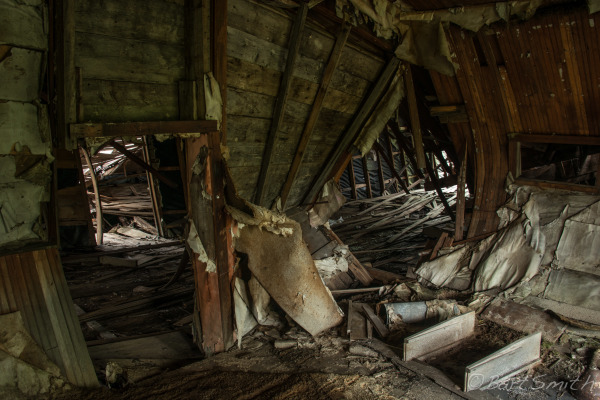 Collapsing interior of the Northern Commercial Company Store in the ghost town of Iditarod. Alaska. 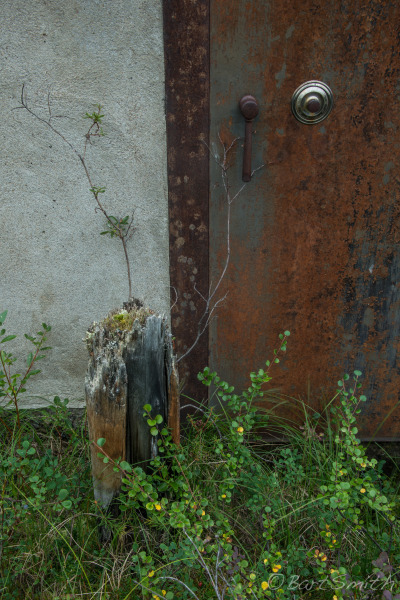 Door to the bank vault in the ghost town of Iditarod, Alaska. 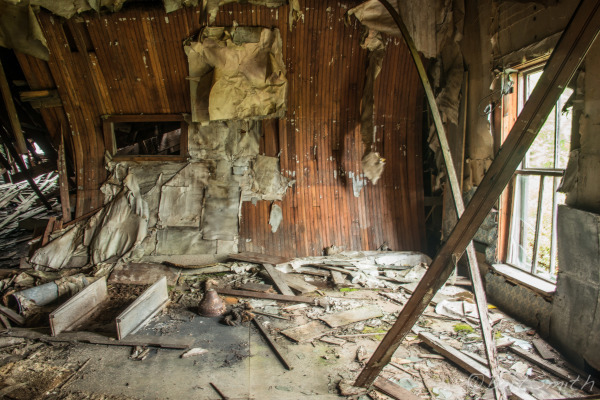 Located in such a remote section of Alaska it was important to have a secure bank vault. 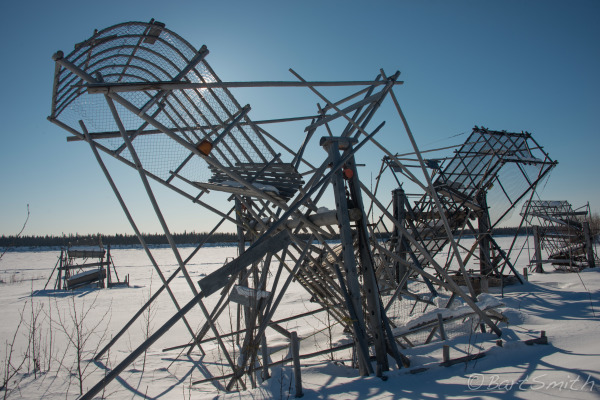 It is still plenty sturdy but slowly sinking into the tundra. 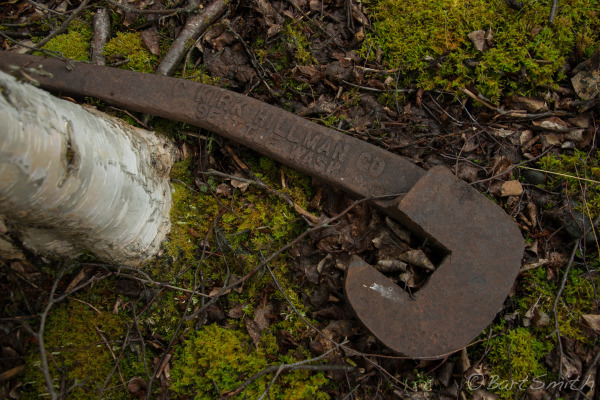 Tool of some sort in the ghost town of Iditarod, Alaska. Exterior view of building known as Tootsie's Bath House. My guess is a hot bath would have been exquisite to the miners toiling in the tiny mine shafts from dusk to dawn. Iditarod, Alaska. 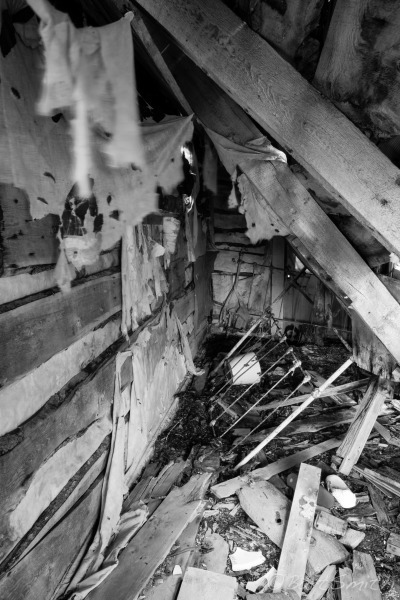 Interior of building known as Tootsie's Bath House, Alaska. 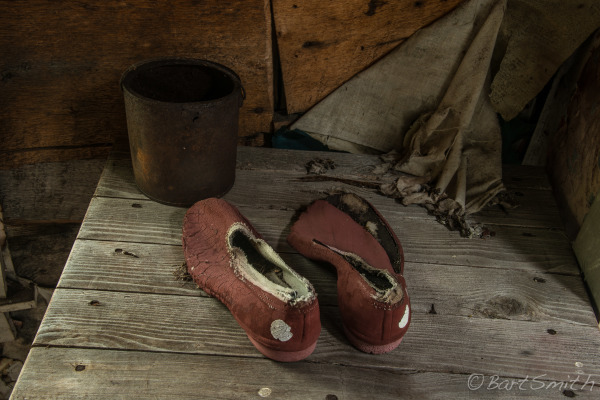 Shoes and sundries from another era in building known as Tootsie's Bath House, Iditarod, Alaska. 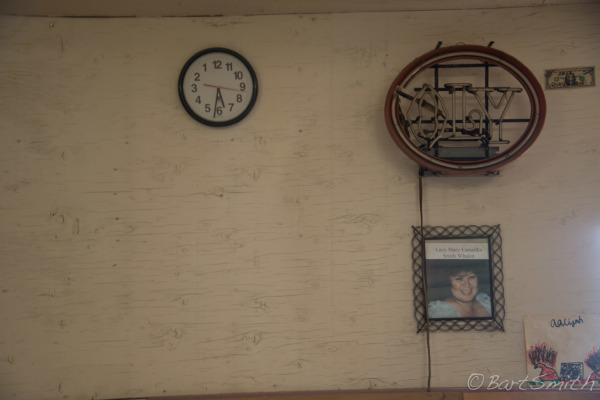 1920 era pin up still hangs on a wall in the Northern Commercial Company Store in the ghost town of Iditarod, Alaska. 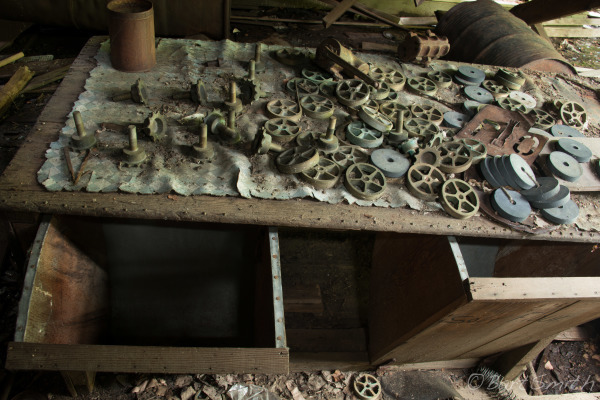 Mining equipment still on drawers in the Northern Commercial Company Store in the ghost town of Iditarod. The building is partially collapsed and one of just a few buildings still standing. Iditarod, Alaska. 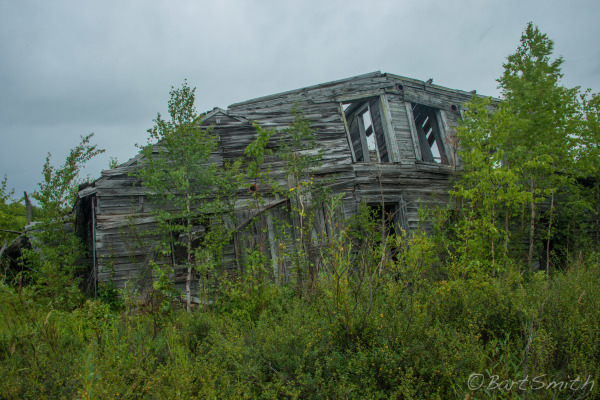 Post office which was officially closed in 1998 in the recently abandoned ghost town of Flat, Alaska. 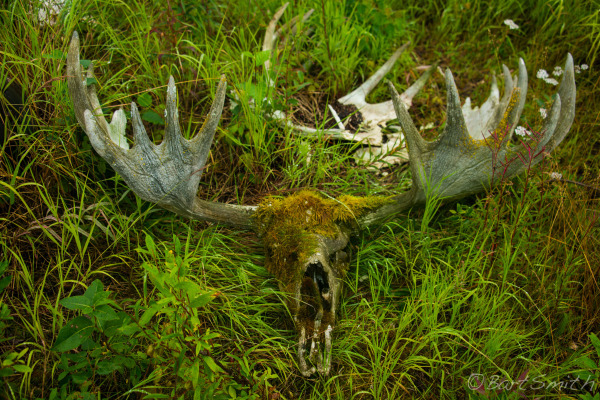 Moose skull, ghost town of Flat, Alaska. 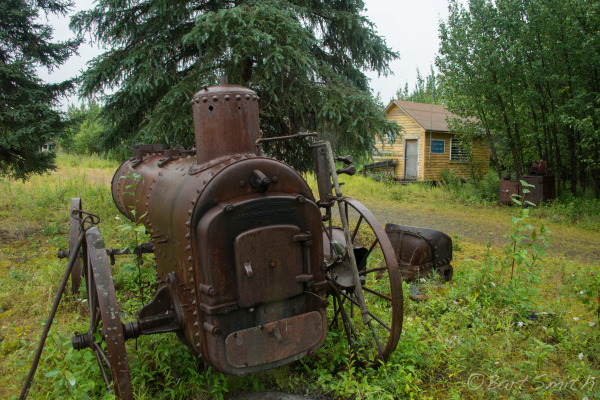 Steam car in ghost town of Flat, Alaska. 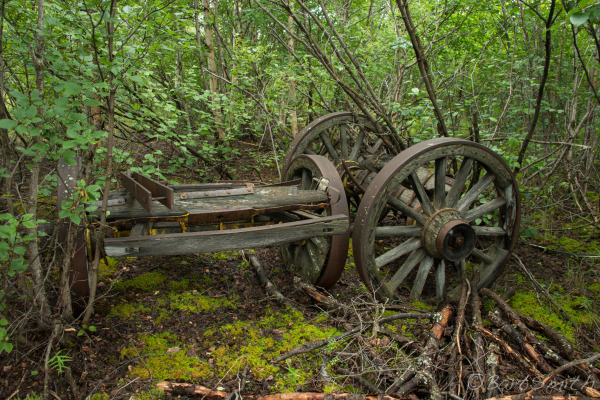 Massive axles and wagon wheels in ghost town of Flat, Alaska. 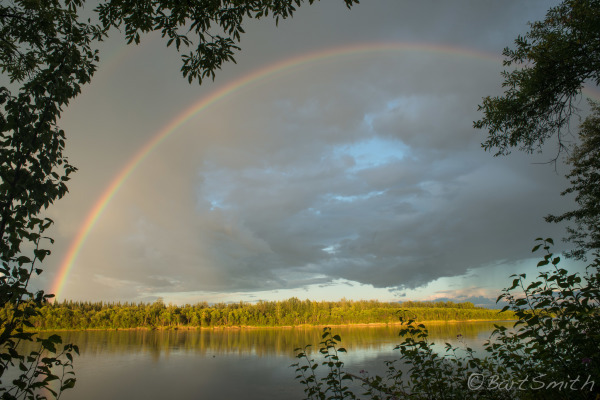 Rainbow over the Kuskokwim River, McGrath Alaska. 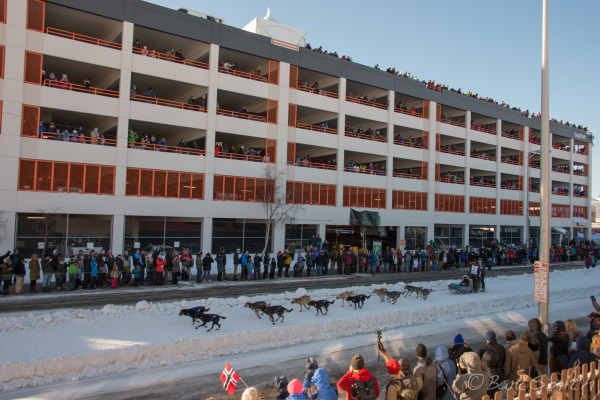 Symbolic start of the 2017 Iditarod, downtown Anchorage, Ak. 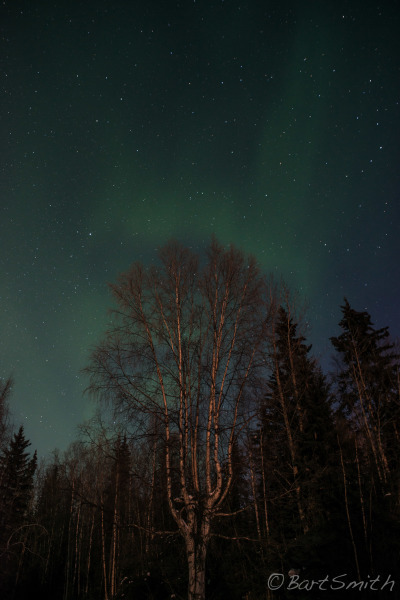 Northern lights over Birch Tree, Manley Alaska. 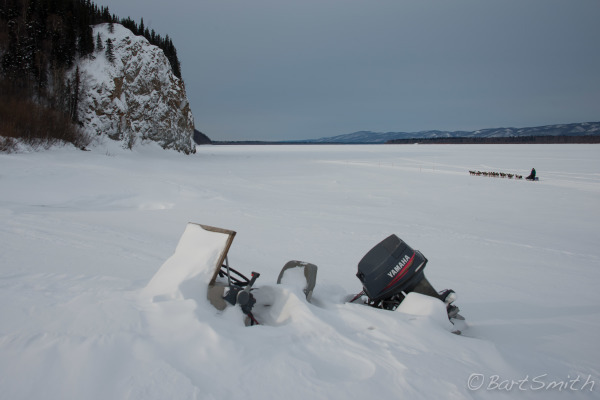 Fish wheels on shore of the Yukon River, Tanana, Alaska. Dog sled team on the Yukon River, Alaska. 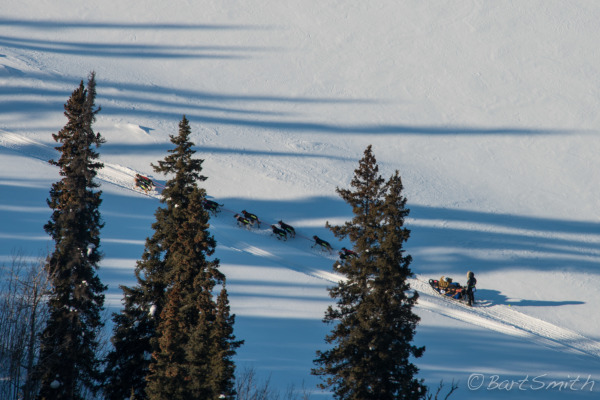 Dallas Seavey's dogsled team nearing Ruby checkpoint, Ruby, Alaska. 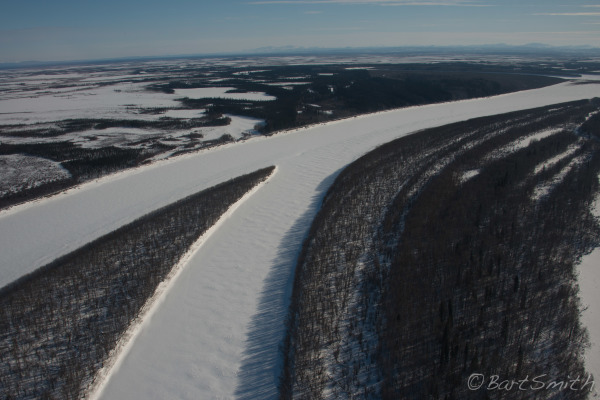 Dogsled team approaching "the rocks" along the Yukon River from Ruby, Alaska. 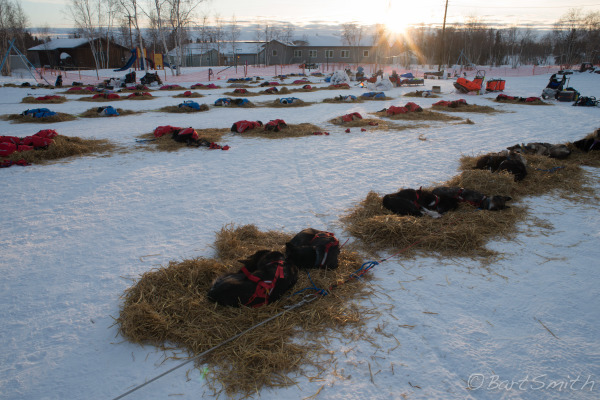 Sunrise over resting dog teams at Huslia checkpoint, Huslia, Alaska. 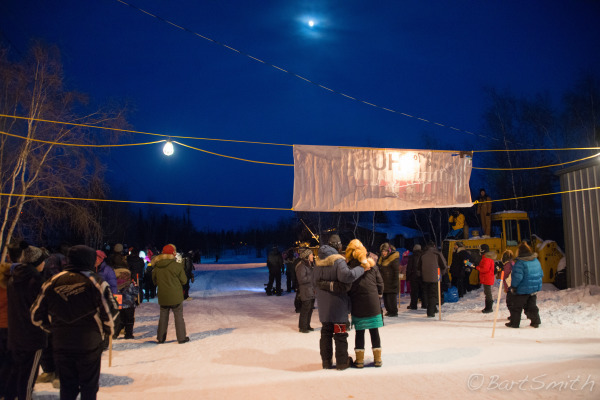 Party atmosphere as villagers await arrival of the first dogsled team at Huslia checkpoint, Huslia, Alaska. 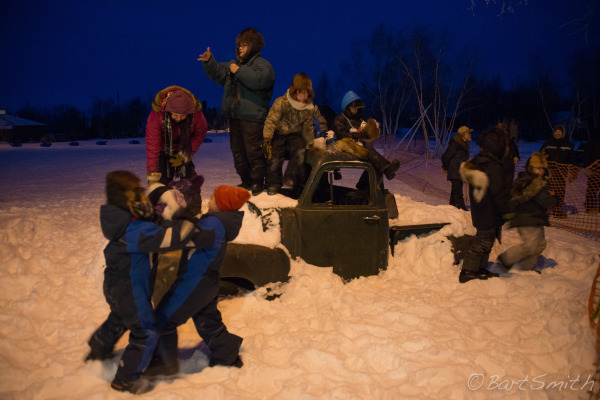 Villagers await arrival of the first dogsled team at Huslia checkpoint, Huslia, Alaska. Aerial view of Huslia River from near Huslia, Alaska. 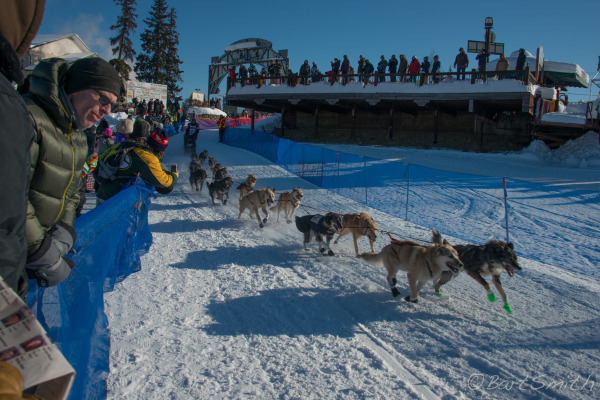 Iditarod dog team arrives at Huslia checkpoint, Huslia, Alaska. 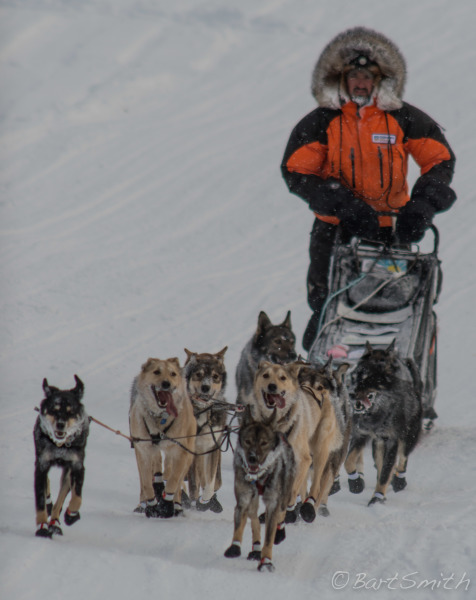 Iditarod racer tending to his dogs at Galena checkpoint, Galena, Alaska. Alaska state of mind, Galena tavern, Galena, Alaska. 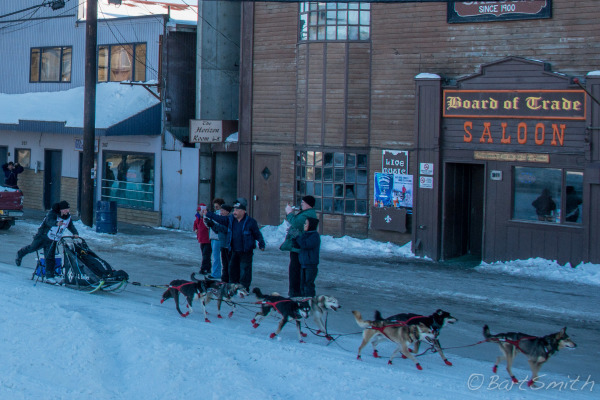 Dogsled team leaving Galena checkpoint, Galena, Alaska. 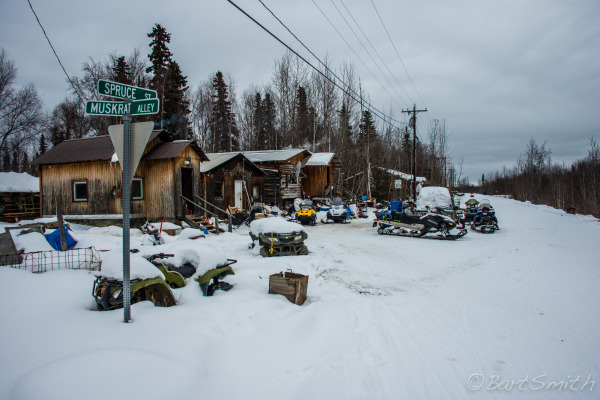 On the corner of Spruce St and Muskrat Alley, Koyukuk, Alaska. 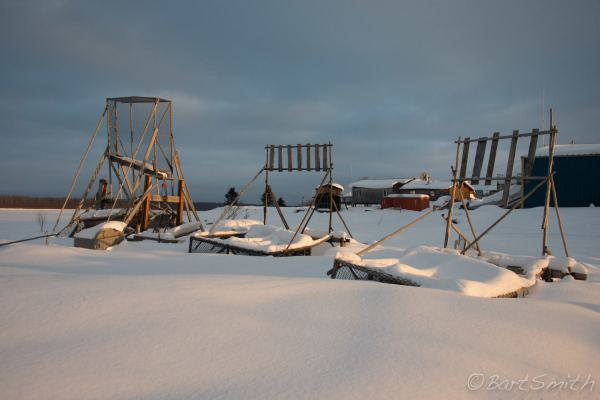 Fishing wheels in the village of Kaltag, Alaska. 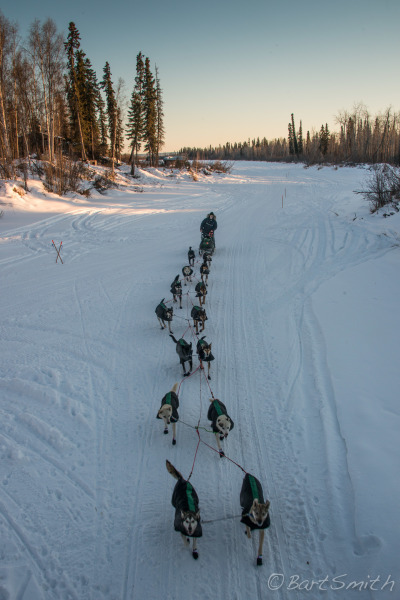 Iditarod race team nearing Kaltag checkpoint on the Yukon river, Kaltag, Alaska. 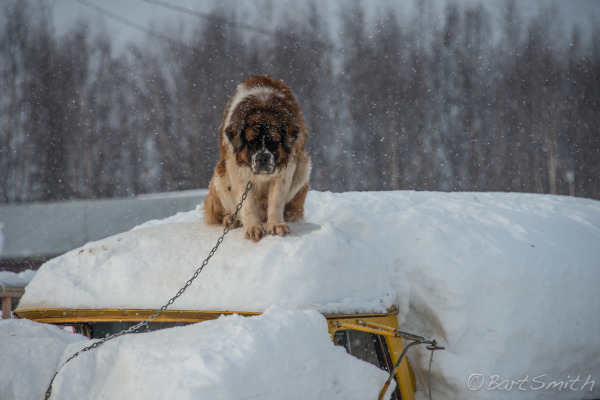 St Bernard mildly impressed with the passing sled dogs in Village of Kaltag, Alaska. 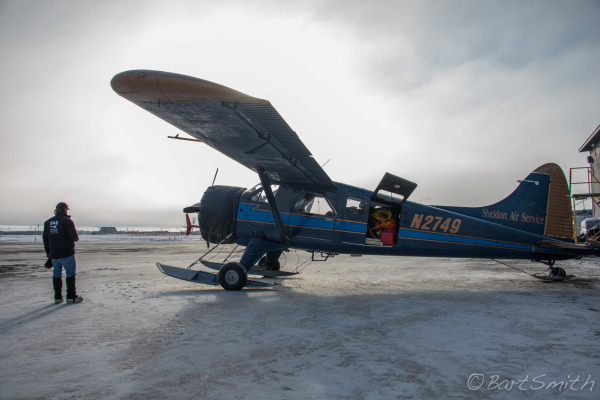 David Lee, pilot and all around good guy beside our plane, a 1953 de Havilland Beaver. Thank you Sheldon Air Service and David, Holly and Bob for the awesome Alaskan flyover. Iditarod dog team passing fish drying rack near village of Koyuk, Alaska along the Norton Sound..
Iditarod dog team passing Koyuk cemetery, Koyuk Alaska. 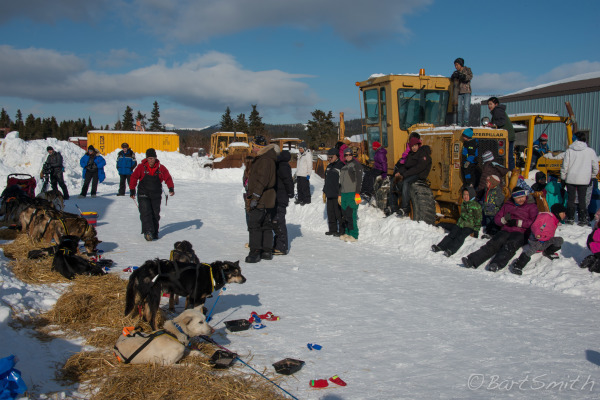 Elim villagers and spectators watch Mitch Seavey tend to his dogs upon being the first Iditarod race team of 2017 to arrive at the Elim checkpoint, Elim, Alaska. 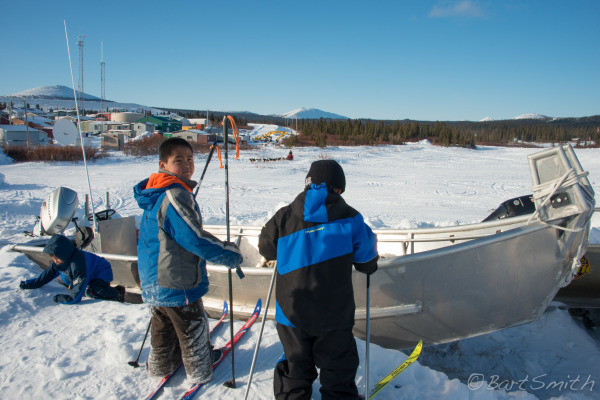 Local boys sort of watching Mitch Seavey and his dog team leaving the village of Elim on his victorious 2017 Iditarod race. 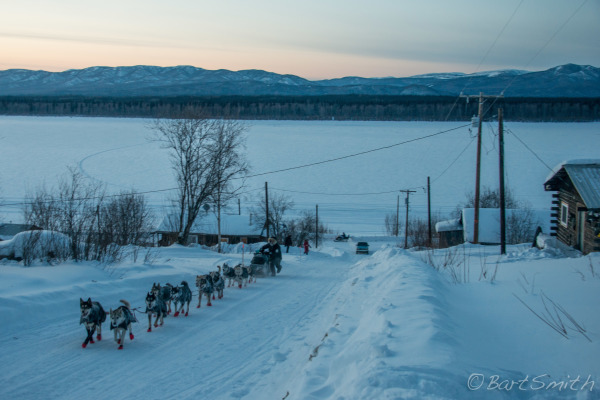 Mitch Seavey and his dog team leaving the village of Elim and heading towards White Mountain on his victorious 2017 Iditarod race. 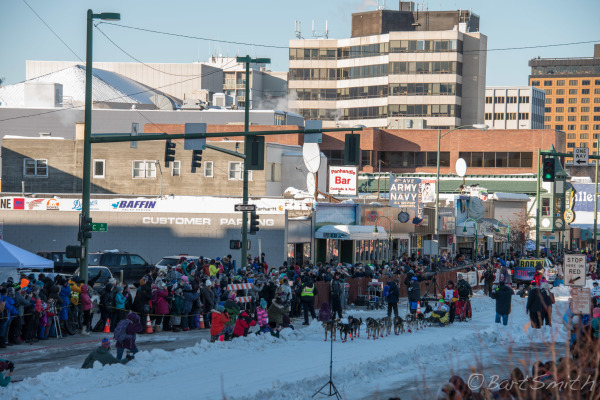 Crowds cheer the arrival of the winner of the 2017 Iditarod Race, (Mitch Seavey) in Nome Alaska. 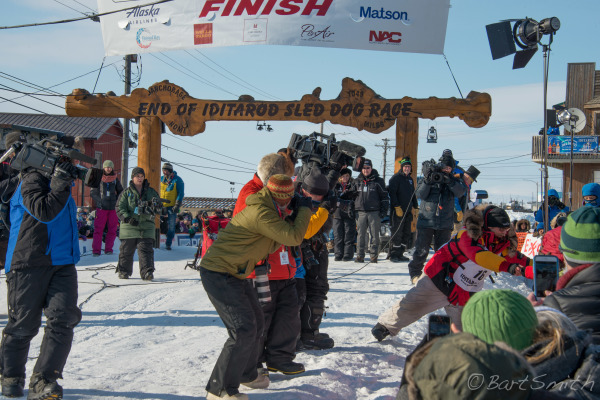 Mitch Seavey the winner of the 2017 Iditarod arriving at the finish line in downtown Nome, Alaska. Mitch Seavey, winner of the 2017 Iditarod, Nome, Alaska. 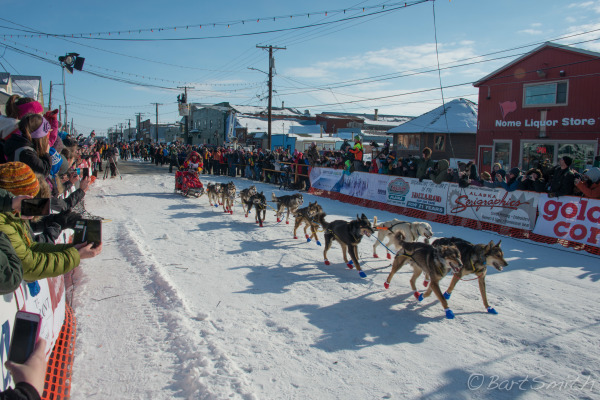 Dallas Seavey, second place finisher of the 2017 Iditarod passing up a free beer as he nears completion in Nome, Alaska. 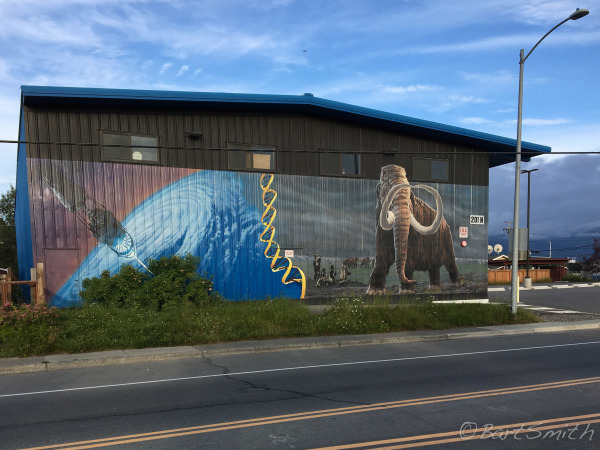 Mural on side of building in Seward, Alaska. Near the southern starting point of the Historic Iditarod Trail. Amazing mural on building in northwest Anchorage, Alaska. 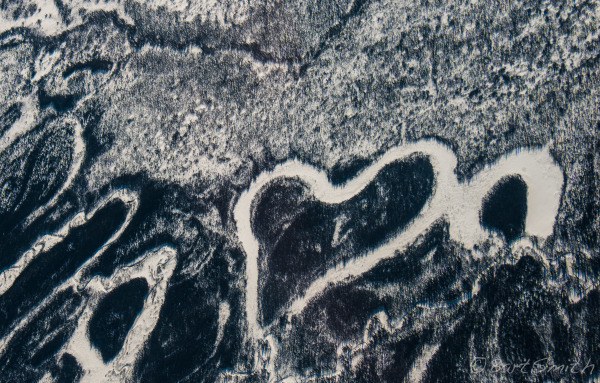 Aerial view heart shaped river bend, Alaskan Wilderness. 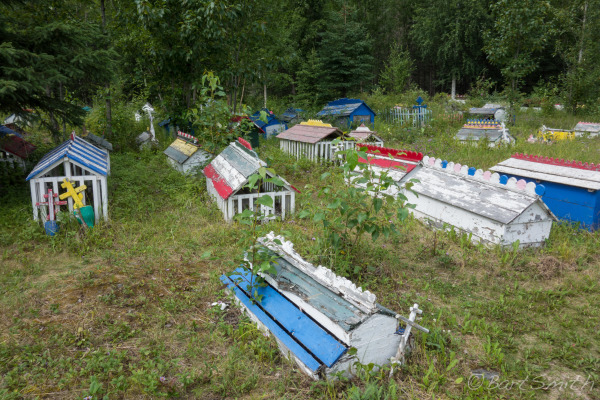 It is fitting that Alaska's primier dogsled trail - the Iditarod - was among the first NHTs established by law. 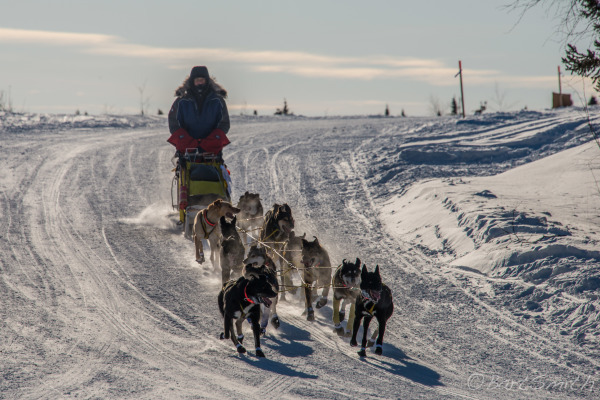 Each year, parts of the Alaskan route hosts the Iditarod Dogsled Race in late winter for 11 days over 1,100 miles. 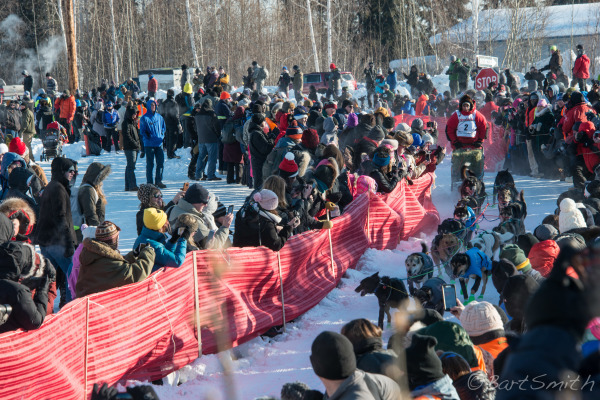 The mushers race their teams across the harsh Alaskan widerness against time and the elements. 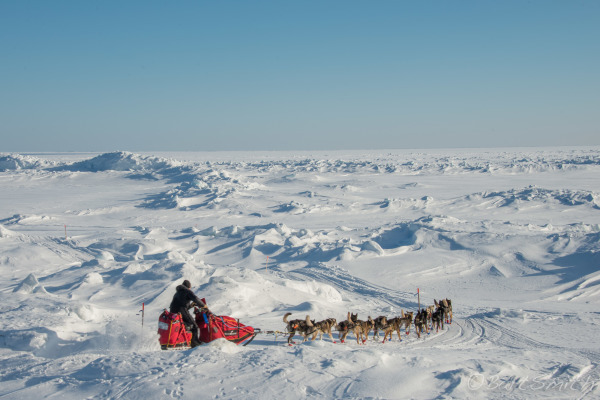 In many places, dog sledding still serves as the most effective method of transportation carrying people, goods and supplies across frozen terrain. Senator Earnest Gruening (D-AK) participated in the discussions leading to the 1968 Trails Act. 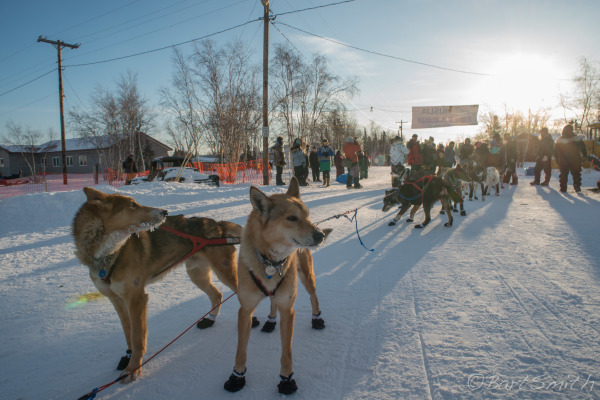 He wondered if trails like the Iditarod could be included in this new national system of trails. 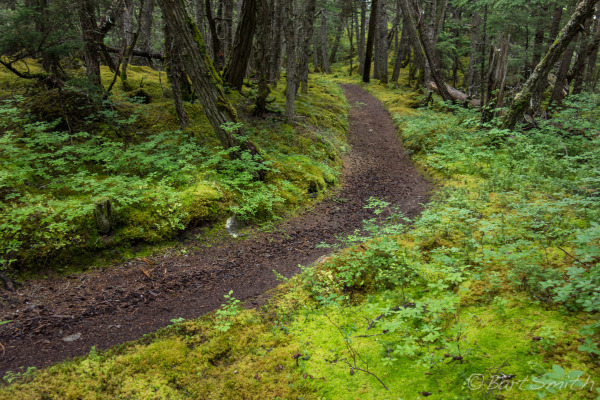 This trail had deep prehistoric roots, for it is believed that people have been negotiating trails across "The Great Land" for approximately 15,000 years. 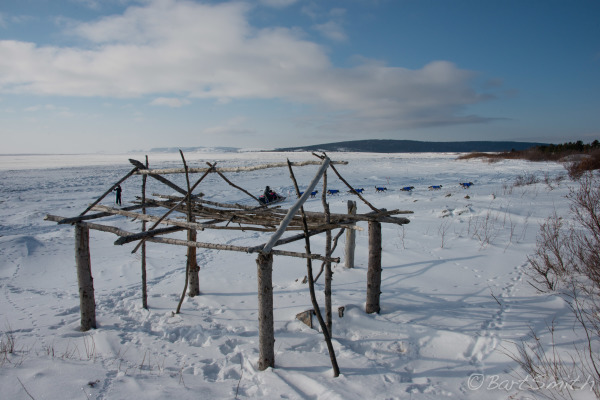 For centuries this trail served as a trade route for the native Ingalik and Tanaina peoples. 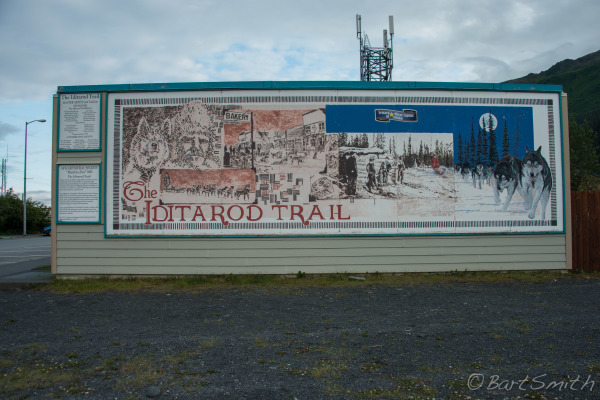 The present day Iditarod follows the trail of the last great Klondike gold rush. In 1909 gold was discovered on the shores of the Iditarod river. 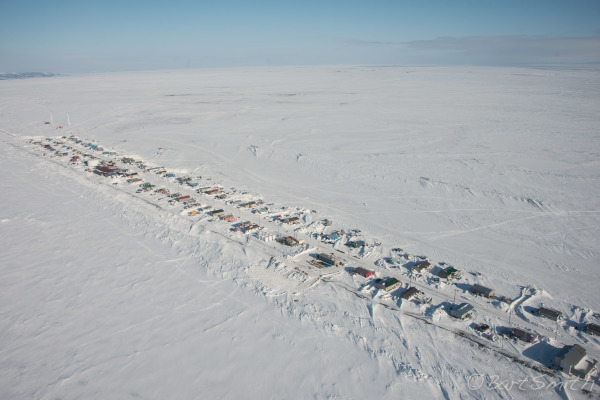 As word got out, the boom town of Iditarod sprung up to meet the demands of the many gold seekers. 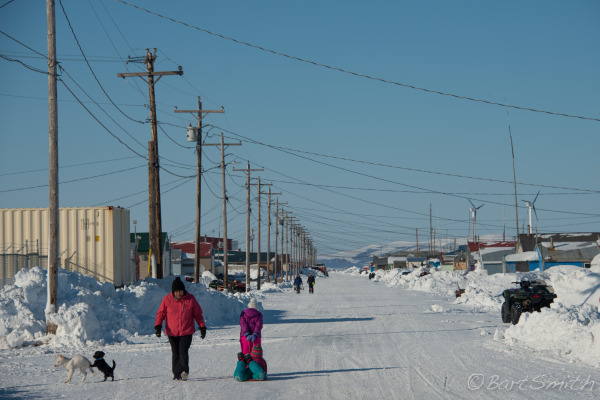 Today only a few buildings remain of the classic Alaskan gold town of Iditarod but it's name lives on in Alaskan lore. 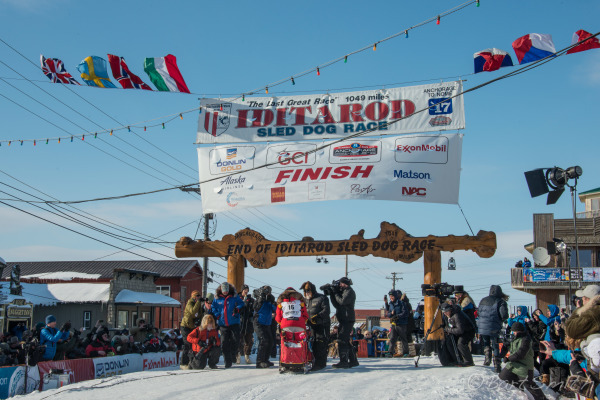 This NHT is administered by the Bureau of Land Management with the help of the Iditarod National Historic Trail Alliance. 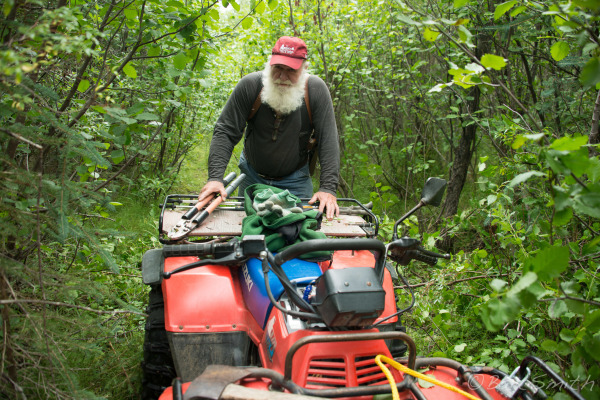 Many trail sections are maintained by dedicated trail volunteers.